This Claddagh wedding band is available in two combinations of white gold and yellow gold. The three Claddagh symbols on this 14K gold Claddagh wedding ring are separated by the words: friendship, loyalty and love. This 6.5mm wide Claddagh wedding band for either women or men features light weight rims and is available with either a white gold center with yellow gold rims or yellow gold rims with a white gold center. 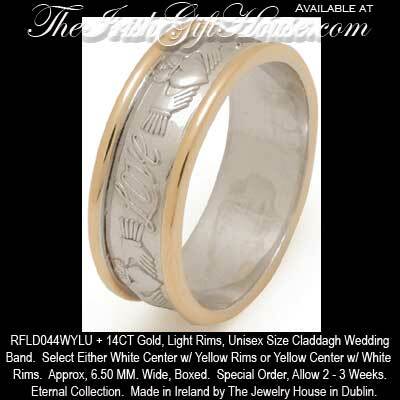 The Claddagh wedding ring is gift boxed with the Claddagh Legend and the Galway Folklore. This gold Claddagh wedding ring is made by special order by TJH in Dublin, Ireland; please allow 2 - 3 weeks for delivery.